Servicemen rushed to rescue little children from a day care center in Sderot, Israel, when Palestinian militants fired a rocket into the center. None of the 15 babies at the center was hurt. But frantic parents across the city - already furious over the government's failure to protect them and their children from the near-daily rocket fire - pulled their children out of schools on the second day of the academic year. Army officials said the militants had fired six rockets at the southern Israeli city situated only a few kilometers (miles) from the Gaza Strip. At least one of the six rockets had reached the target. The Islamic Jihad militant group claimed responsibiity for firing three. Batya Katar, head of the Sderot Parents Association, said parents were pulling all 2,500 of the town's students out of school. "Buses are already on the way to pick up students who haven't been taken home already," Katar told The Associated Press by telephone, the voices of panicked parents audible in the background. The government promised to move students out of the city if there was an escalation in Palestinian rocket fire, she said. "This is an escalation, but there is no sign of any solution," Katar said. Wary parents in Sderot threatened not to send their children to school on the first day of the year on Sunday. But they lifted the strike threat after being promised the schools were properly protected and that shelters had been upgraded. 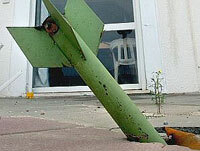 Sderot, a working-class town of 22,000, has been battered by thousands of the crude projectiles launched in recent years from Gaza. The rockets rarely cause serious injuries or damage, but they have killed 12 people in the past seven years, and because of their frequency, wreak panic in the city. To calm jittery residents ahead of the school year, the military dispatched more than 200 soldiers to accompany students back to school in Sderot and instruct them on emergency procedures.